This week Ruby Assembly are bringing the 9 to 5 glamour courtesy of the discerning eye of Melbourne business fashion blogger Cheryl Lin of Businesschic. Cheryl’s take on fashion blogging is totally unique – instead of discussing the wacky and unwearable runway trends, Businesschic focuses on working seasonal trends into our existant wardobes. Worry no more about having a dull workaday uniform, and take some hints from Cheryl’s blog. She’s like the Melbourne Sartorialist for Collins Street chic. Bravo! What makes your business magical, setting you apart from other competitors? 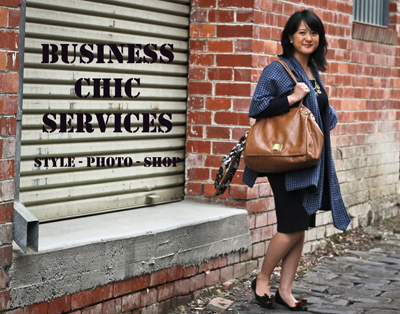 It’s still early days for Business Chic; currently it is a streetstyle fashion blog focussed on workwear. I take photographs of what real people wear to work to give the rest of us ideas of what we can wear within our respective workplace dresscodes. Being somewhat shameless to approach strangers and asking to take their photo! However I like to think that I’m creating a resource that will be useful for all. In future I wish to work on my powers of persuasion so that I can better convince folks of all shapes, ages and sizes to allow me to photograph them; I’d like BusiChic to better showcase the diversity of our workforce. I’m perplexed by the number of times I’ve been snapped at by women who say that they are “too old” when they look so fabulous! Lots of early memories but one of my favourites would be going to the hospital to meet my baby brother for the first time. At this relatively early stage I’d say to follow your gut feel. I like working with people who have a sense of purpose, similar values to my own and a sense of humour is also a must. Annie Leibovitz or if she isn’t free, Tina Fey – love.their.work. Helena Christensen, I photographed her on the catwalk during the L’Oreal Melbourne Fashion Festival and I now have an even bigger girl-crush than I did before. The fact that she is an ace photographer is also a factor. Guillaume Canet – french actor/heart throb, I fell for him in “Love me if you Dare”. Unfortunately so did his lead actress, Marion Cotillard and now they’re having a bub together. Just my luck! And if I could, Gregory Peck – from his roles in “Roman Holiday” to “To Kill a Mockingbird”; what a gentleman! Oh dear, you haven’t specified a number and now I’m on a roll – Will Smith. Enough said! 9. What is something unexpected that has come from running Businesschic? The people I’ve gotten to meet who have become good friends as well as the opportunities for collaborations across my different fields of interest – watch this space!